As part of their 50th anniversary, ISACA Vancouver held their premiere privacy and security awareness campaign entitled 'The BC AWARE Campaign 2019'. It unites Industry, Government and Higher Education to raise public awareness and foster growth and development of the security and privacy professions. The conference took place at beautiful Pan Pacific Hotel and Convention Centre in downtown Vancouver. 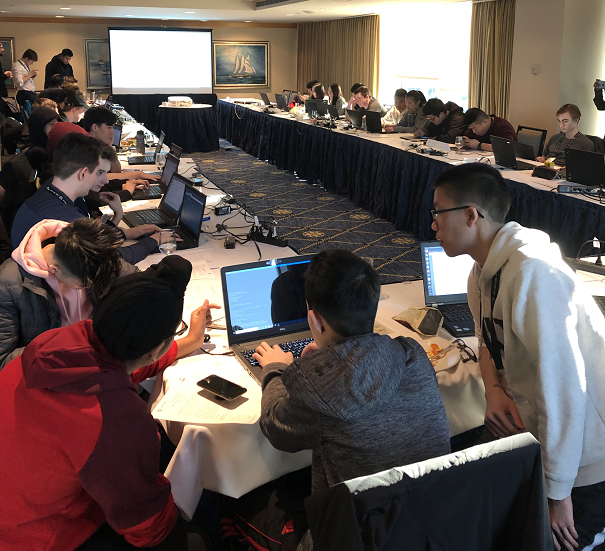 For the third year in a row, the team with BCAware has invited members of the CCDC team to participate in the conference by way of a CTF that challenges high school students. This year, we are pleased to say that we doubled the amount of students participating in the event. There were upwards of 40+ students representing four local high schools. This year CCDC partnered with a few industry professionals to provide a scenario where students were expected to make a presentation to a panel of judges. They had the opportunity to present their findings and recommendations; which in turn, helps them develop their leadership and communication skills. The judges were completely blown away by the quality of the presentations. Congratulations to Team Inspect from Killarney Secondary for placing 1st, Team BOsFH from Burnaby South for placing 2nd, and Team Sigma with students from Killarney Secondary, Burnaby South and Frank Hurt Secondary for placing 3rd.